A Tiki Alternative to Thanksgiving Are you bored with the same, old Thanksgiving dinner? Take the Tiki route instead. Day to Day contributor Charles Phoenix offers recipes for a meatloaf in the shape of a Tiki god, and other exotic delights. 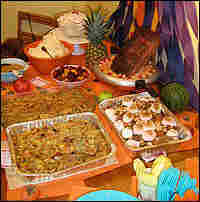 The full Tiki Thanksgiving spread. You love Thanksgiving dinner. But admit it — you're getting tired of the same, old, traditional dishes year after year, decade after decade. So this year, let's try something different — a Tiki Turkey Dinner. 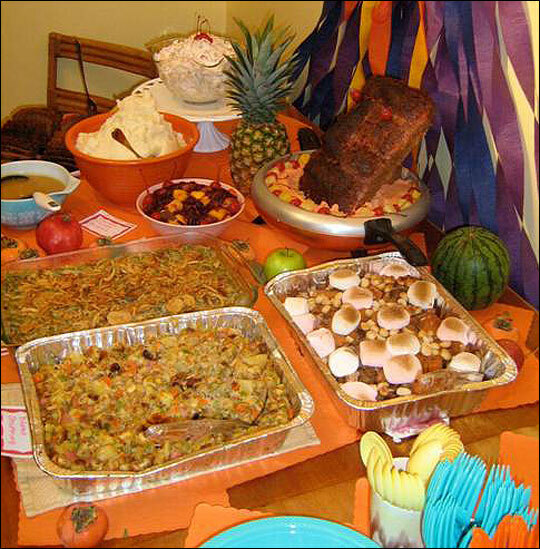 It's the traditional Thanksgiving dinner menu with an exotic Polynesian twist! And what a taste treat sensation it turned out to be! We've replaced the roast Tom Turkey with a turkey meatloaf carved into the shape of a Tiki god. This gives "carving the turkey" a whole new meaning. Mangos make cranberry sauce sensational. And there is no more cornbread stuffing. It's now Hawaiian bread stuffing with ham and pineapple. Doctor up the yams by adding bananas, Kahlua, and macadamia nuts to the toasted marshmallows. Yum! I had a feeling coconut curry would completely reinvent the green bean casserole, and it did. The mashed potatoes are served in the shape of a giant volcano. And the lava? Gravy! Dessert had to be special (and flaming) so I invented the Flaming Coconut Pineapple Apple Pumpkin Upside-Down Pie Cake — a two-layer yellow cake with a pumpkin pie baked into one layer and an apple pie in the other. The top of the cake looks just like a pineapple upside-down cake and the sides like a coconut cake. As if the flame effect before serving wasn't enough, the guests gasped when I cut into it, revealing the pies hiding inside. I greeted each guest with a lei, served up tropical cocktails and spun the exotic sounds of Martin Denny on the stereo console. After dinner, it's time to do the limbo. How low can you go? Charles Phoenix is a regular contributor to Day to Day, and the author of God Bless Americana: A Retro Vacation Slide Show Tour of the USA. 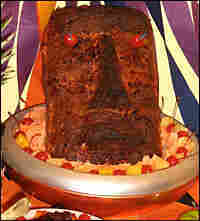 A Tiki carved out of meatloaf. It'll be the centerpiece of your buffet table and the talk of the town. Squeeze sausage from casings and add to turkey, bread crumbs, seasonings and well-beaten eggs. Fill each of the two small loaf pans with mixture. 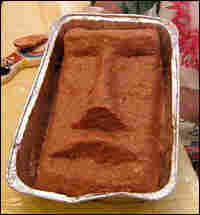 Fill the large tin with the remaining mixture.Get creative and shape it like the face of a Tiki god. Smooth the meat's surface with olive oil "painted on" with a spatula. Bake at 350 degrees for 40-55 minutes or until a probing meat thermometer reads 170 degrees. Drain off fat and remove from pans. Let sit 15 minutes before serving. Slice and serve only the smaller loaves. 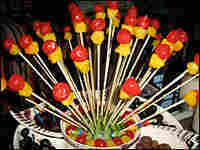 Make a "face"on the Tiki loaf by sticking maraschino cherries and pineapple chunks on with multicolored toothpicks. In a very special raised serving dish or a vintage electric skillet, prop the Tiki up by leaning him on a tall glass fixed in a bed of mashed potatoes dyed orange. 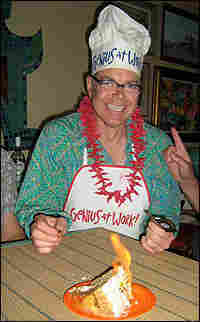 Garnish with more maraschino cherries and pineapple chunks (lightly tossed in yellow food coloring) and lit votives sunk into the mashed potatoes. Combine ingredients, chill and serve. Tear bread into small pieces. Saute onions, celery, carrots, ham and well-drained pineapple in butter until the onions are translucent. Combine mixture with bread, stock, soy sauce and seasonings. Cover with foil and bake at 350 degrees for 30 minutes. Remove foil and bake uncovered 5 more minutes until it is crunchy golden brown on top. Serve. Sauté bananas and brown sugar in the butter until it bubbles. Pour mixture over well-drained yams and add Kahlua. 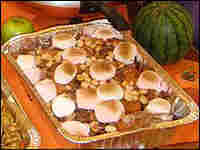 Cover with foil and bake at 350 degrees for 20 minutes. Remove foil, top with marshmallows and macadamia nuts and bake uncovered for 5 more minutes until the marshmallows are toasted on the top. Serve. Combine well-drained beans with soup, coconut curry and peanut butter. Cover with foil and bake for 20 minutes. Remove foil, top with onion rings and bake uncovered 5 more minutes. Serve. Cut potatoes into bite-size pieces and boil in salted water about 15-20 minutes until tender. Mash in milk, butter and sour cream. Shape them into a volcano and serve. Defrost pies to room temperature. On top of the pumpkin pie, place well-drained pineapple rings and maraschino cherries in symmetrical pattern (think pineapple upside-down cake.) 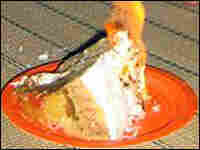 Place decorated pumpkin pie face down and centered in a 9-inch round cake pan. Remove pie from tin and cover with half of the batter. In the other cake pan, place the apple pie face down, remove tin and cover with the remaining half of the batter. Bake according to box instructions. Cool and remove from pans. Place apple pie layer face up on very special cake plate and frost the top. Place pumpkin pie layer, pineapple-side up, on top of that. Frost the sides with remaining frosting and cover with coconut. Just before serving, pour lemon extract in the middle of the top of the cake. Gather guests around, turn out the lights and light it with a match. Everyone will gasp! Then eat it! WATCH VIDEO: Charles Phoenix serves up a tiki dinner to Day to Day host Madeleine Brand, her husband Joe and director Shereen Meraji.